Two men, one with serious injuries, have been taken to hospital following what some have described as a van exploding, outside a convenience shop on Mare Street. The man with very serious injuries was taken to a trauma centre. 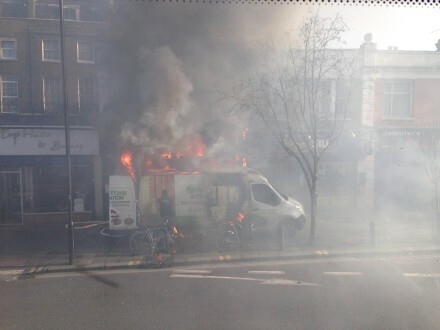 The fire gutted the spray foam insulation van, badly affecting the shop and the first floor flat above it. Four fire engines from Bethnal Green and Stoke Newington with 20 fire fighters, brought the blaze under control in just over an hour. Parts of Mare Street near Richmond Road remains closed.